As my photography’s improved, I often look back at my earliest posts and I just want to do it over, for sake of getting a better photo. I’ve made madeleines before, though with this round I get to do another take with more detailed instructions – adding things that I do to make my life easier, like putting the madeleine pans on a baking sheet (or cookie sheet) so that it’s easier to take in and out of the oven, but didn’t think of adding to my first instructions. Madeleines are little cakes, and they’re probably best known from the “madeleine episode” from Marcel Proust’s In Search of Lost Time. (I quoted this passage when I posted my first madeleine recipe.) A near paradox of the madeleine Marcel Proust described and those who try recreating, in vain, the one he described is the crumb: madeleines are generally moist and soak up liquid like a sponge, whereas it is implied that M. Proust’s madeleine was dry and required to be dunked in the tea, sort of like biscotti. However, it is suggested by some theorists that perhaps the madeleine didn’t exist as there is no mention of it or any other baked goods that triggered childhood memories in M. Proust’s personal writings, and that it only served as a vehicle for this trip down memory lane. I’ve become fixated on these “squat, plump little cakes” again, to quote M. Proust, since I got blueberries. And since blueberries and lemon go so well together, well – why not? The only special equipment you’ll be needing for these are madeleine pans, which come in a variety of sizes from the size shown here to mini, bite-sized/petit four size. You can of course use something else such as a muffin pan if you don’t have a madeleine pan, although they won’t be madeleines then. Madeleines are essentially defined by their scalloped, shell shape. (Since making my first madeleines over two years ago, before I had this blog, I’ve seen madeleine pans more often and easier to find.) How they got the name “madeleine” is debatable and often versions of how it acquired the name conflict, although the story most often told is that it was named after a pastry chef, Madeleine Paulmier, from either the eighteenth or nineteenth century. 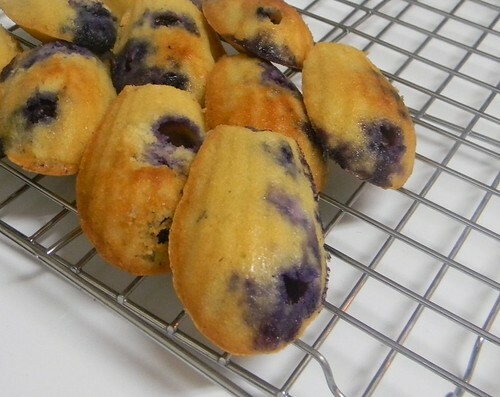 This is basically the same recipe for my lemon madeleines but with blueberries thrown in, and a couple ingredients tweaked. What I like about these madeleines, and the lemon ones, is that they’re incredibly simple and require very few ingredients, making them a cinch to whip up. The main thing that differs from my recipe for madeleines and other recipes is that I don’t use fat, such as coconut oil, in the batter, I’ve recently realized. All the other recipes I’ve seen for madeleines usually add melted butter to the batter. Am I missing out on something? Does adding a kind of fat like melted butter, or a dairy-free equivalent thereof, contribute something to that fine, delectable crumb? As far as greasing the madeleine pans go, some people like using oil and others like using butter or shortening, as they believe buttering the pans makes better madeleines and they’re easier to ply out. Do whatever feels right for you. Preheat oven to 350ºF. Generously grease madeleine pans with oil of choice or shortening. Place on a baking or cookie sheet for an easier time when putting in and taking out of the oven. Mix the eggs, honey, and extracts together. Add the almond flour, mixing completely, and fold in the blueberries, stirring gently. Fill the prepared molds, either pouring or spooning in, almost to the top. Bake for 20 minutes. The madeleines will be soft. Cool before removing from pans, to prevent crumbling. Gently loosen edges with a butter knife and gently ply and ease out the madeleines using the same butter knife or a spoon, or both. They should come out easily and cleanly from the molds. Enjoy! Those came out so nicely! Hard to believe they are made with nuts. I agree…I often want to go back and redo recipes just for the new photos! Those look so simple and so delicious. Is there a way to make these without a madeline pan or should I run out now and buy one? I can’t wait to try these. Yum..
Hi CDM, if you want the scalloped, shell shape you will need a madeleine pan. If you’re not concerned about the shape, you can make them like muffins or cupcakes, though keep in mind that because of the shape they won’t be madeleines anymore. Madeleine pans come in metal (including non-stick) and silicone. I’m almost out of almond flour … serious problem! Especially when I see recipes like your madeleines, Zoe. 😉 I’m not much for special pans usually, but I can see the appeal of having a madeleine pan for sure! How lovely! Hi Shirley, like you I’m generally of the same mind about special pans – I’ll try to improvise with what I already have or make adjustments like using a bundt cake batter to make into cupcakes, though madeleines are a bit of an exception. The pans I have I got a couple or so years ago for $2.00 each at Daiso, a Japanese dollar store. My pans are circular, with five molds for the madeleines, although most madeleine pans are long and rectangular as seen on other food blogs and in stores. Wow, what a lovely flavor combination. I’ve never made madeleines, and never out of almond flour. Great recipe! Hi April, I’ve never eaten a “real” madeleine, so I’m not sure! But they’re pretty darn tasty. 🙂 They’re moist and soft, not dense at all. Hope you like them, if you give them a try! Hi, thank you so much for your answer and sorry for my late reply! I just remembered having asked this question when I read your latest post. 🙂 I’m a huge fan of “real” madeleines but haven’t had one for a very long time… I’m definitely going to try these, and I’m positive I’ll love them whether they taste similar or not. 🙂 Thanks again!